Famine pots are giant cast iron vessels, which were created to cook large volumes of soup to feed the starving Irish in 1847, the bleakest year of Ireland’s Great Hunger, now known as ‘Black 47’. Mattie Lennon, a reader of my blog, and an avid Dublin folklorist, poet and author, contacted me to let me know about a project currently underway to preserve these old pots. The idea is the brain child of a Donegal man, John Cassidy. But before I hand you over to Mattie, to tell us about their amazing work, let me fill you in on a little bit of history behind these pots, and their significance as a link to our Irish cultural heritage. The failure of the potato crop first affected the Irish in the autumn of 1845, and by 1847 Ireland was a country of homeless, starving paupers. Prior to 1847 famine relief was provided through employment schemes. Recognizing the need for farmers to be free to work the land, the British government abandoned the work schemes, and replaced them by providing the starving Irish with ‘soup’ through the Soup Kitchen Act of January 1847. 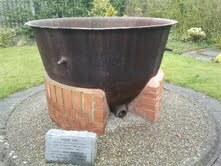 Soup was cooked in large cast iron cauldrons which have come to be known as famine pots, soup boilers or workhouse pots. These durable pots were made in a Quaker iron foundry owned and run by the Darby family in Coalbrooke in the Severn Valley of England. Initially 600 of these durable cost iron pots were supplied by the British government. An additional 295 pots were provided by the Society of Friends or the Quakers. The Society of Friends demonstrated incredible generosity during the Famine. Hiring ships to bring food, medicine and supplies, they are credited with saving many lives. 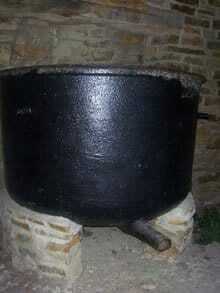 Soup was made in the famine pots using a variety of recipes or from whatever scraps the people could afford. Nettles and wild herbs were added. The nutritional value of these soups was very questionable. 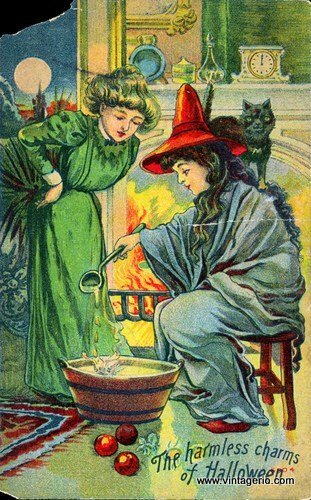 Many soup recipes were lacking in nutrients, vitamins, and minerals, and over time gave rise to scurvy and other diseases. Some were so thin or watery they caused intestinal ailments such as diarrhoea. However, no matter how deficient these soups may have been nutritionally, a bowl of watery soup was sometimes all that stood between a poor Irish person and death. Many of our ancestors stood in line with an empty can in hand, eager to have it filled with soup, brewed in these famine pots. No matter how degrading it may have been for them to join the line of impoverished Irish men, women and children, this soup was a last resort to help quell the pangs of their empty stomachs. These pots tell an important story from our past. However, despite the desperate need of the Irish people for this soup, instructions were issued by the English to discontinue the services of the soup kitchens. By October of 1847 all of the government soup kitchens had closed. The Irish were expected to live off the new potato harvest, which was ready to be picked in autumn of 1847. Unfortunately this harvest was merely one quarter of a normal Irish potato harvest, and the three million people who depended upon the soup kitchens for survival were left to fend for themselves. In 2011 John Cassidy found an old famine-pot, broken in pieces, in south Donegal, had it welded, restored and mounted outside Leghowney Community Hall. Such was the interest shown by American tourists that he decided to do some research on the whole Famine-pot/Soup–kitchen aspect of the famine. As I had worked with John on other projects he asked me to come on board for this one. We found that because of bigotry, pride, misguided patriotism and inherited false information,this aspect of the potato failure was almost air-brushed from our history. Here’s a little video of John Cassidy explaining this project …. In conjunction with An Lár TV we are now making a documentary on the subject. Five prominent historians, Dr. Ciaran Reilly, Fr. Anthony J. Gaughan, Professor Christine Kinealy, Dr Moran and Rob Goodbody, a Quaker historian, have all recorded interviews to camera. We have all the raw footage and are now in need of funding for editing. This doumentary will be broadcast by on An Lár TV which reaches the Irish Diaspora in more than 120 countries around the world including Irish groups and clubs from the US, Canada, Spain, Switzerland, South Africa, Australia, and New Zealand. Here’s a list of some of these clubs and groups …. The Irish community of Gridley, California, USA. The Irish community of Atlanta, Georgia, USA. The Irish Association of South Africa. The Irish Club, Basel, Switzerland. The Irish Club, Brussels, Belgium. The Costa Gaels GAA Club, Marbella, Spain. The Irish Club, Marbella, Spain. Gaelic Athletic Association Toronto Canada. The Uruguay Ireland Association, Montevideo, Uruguay. The Tolosa Gaels GAA Club, Toulouse, France. The Irish Community of Auckland, New Zealand. Auckland GAA, Auckland, New Zealand. St. John’s Avalon Harps GAA Club, Newfoundland, Canada. Tasmanian Gaelic Football Association, Hobart, Australia. The Friendly Sons of St. Patrick, Iowa. The target market for this documentary is Ireland and abroad, mainly the USA. We are also hoping to get the documentary into schools in Ireland and around the world. John and Mattie have created a wonderful website called Irish Famine Pots to explain their fantastic work. You can also learn more about Mattie and read some of his writings and poetry on his own personal website. A big thank you to Mattie and John for undertaking this ambitious and culturally significant project. I look forward to viewing this documentary and hope the will keep us posted on their progress and dates for release of the film. 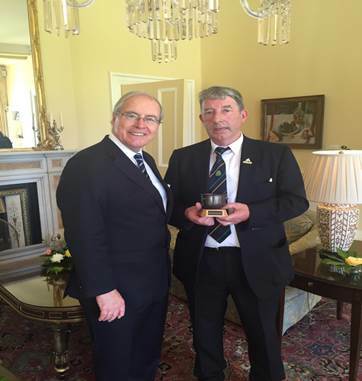 The photo above shows John Cassidy presenting a miniature famine pot to Mr. Kevin O’Malley, U.S. Ambassador to Ireland at his residence in the Phoenix Park, Dublin. The Ambassador’s ancestors emigrated from County Mayo, one of the worst affected areas during the Great Irish Famine. John was invited to a tree planting ceremony to remember the 15th anniversary of 9/11. The original tree was found in the basement of one of the towers. It was nursed back to full health and was replanted at Ground Zero. One of its stems was flown to Ireland and was planted at the Ambassador’s residence in the Phoenix Park in September 2016. Image Credits – All photos published courtesy of Mattie Lennon and John Cassidy from the Irish Famine Pots website. Your latest post was quite interesting, though sad at the same time. 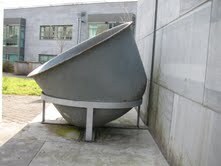 I hope to be able to see the documentary about the famine pots once it is finished. 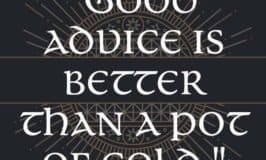 I urge all of your readers to go to the irishfaminepots website and see what is there. Very interesting reading. Thanks again, Mairead. I hope you will follow up with a post about the work houses sometime. Hi Patricia – the information on The Irish Famine Pots website really is interesting. Thanks for checking it out. A post about the work houses is on my to do list. I’ll try to get to it soon. Thanks so much for this great suggestion. I love to hear ideas from readers about topics they are interested in reading about. 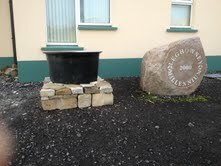 Hi Mairead, RTEs radio flagship programme , Morning Ireland, gave our famine pot project some coverage a few weeks ago. the response from the public has been amazing. We have received a huge number of texts calls and emails requesting further information. Hi John – That’s wonderful news about your radio slot to help spread the word about your fantastic project. Glad to hear Patricia’s comment provided some content inspiration for you. If I get a moment I’ll listen to the podcast tomorrow. Best of luck with the final stages of editing. Looking forward to watching your documentary. 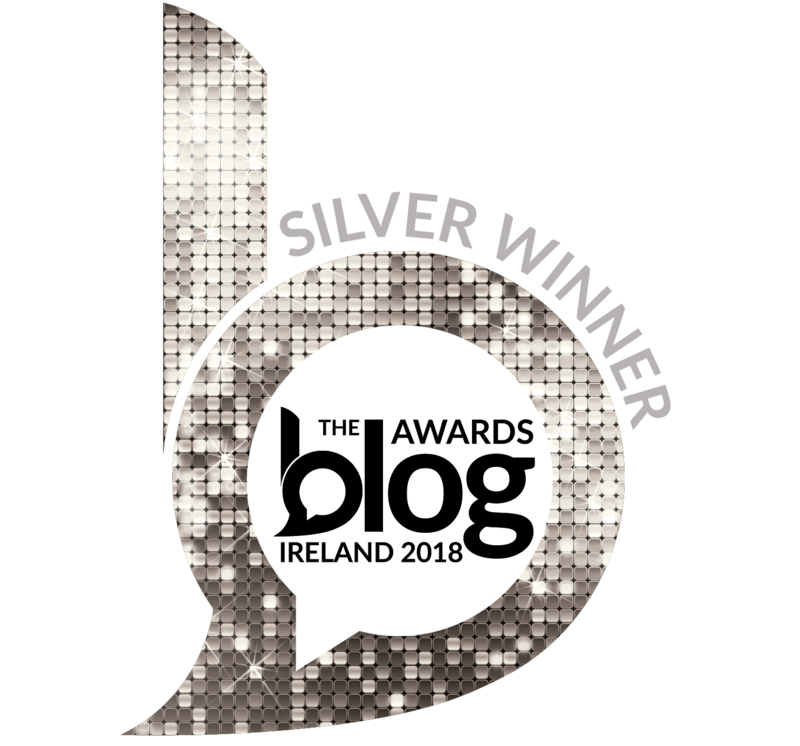 Mairead, I want to thank you so much for all the educational value your blog has on all Irish topics, particularly, now, the “potato famine”. As a former teacher in regular education, we had a script that was prepared and we had to go over this syllabus on the high school level in history. There was nothing about the potato famine in Ireland in most high school history books, and anything was only the most simplistic cursory explanation if it was mentioned at all. (Later, I went into special education until I recently retired.) Now, with Common Core in our schools, I am sure there is still nothing on the potato famine so our children are not learning about history since reading, writing and math our often the main focus, especially in Title 1 schools. Thank you so much for your kind words about my blog. I do tend to ramble a bit, and I cover a vast array of topics, but I must say I truly enjoy this little project of mine. Despite being relatively new to the American education system, I would completely agree with you about how limited history education is in American schools. I think this is very unfortunate. Thank you so much for the title of a book I have not read yet, but will, “Black Potatoes” and the great information you gave me about the wonderful Choctaw Nation that helped us during the Potato Famine. I had no idea, until I read your blog about this wonderful Nation helping us. I love the comments to read, and when I saw that that they were dated in 2011, I wanted to kick myself for not knowing so long ago about your great educational blog. I just began seeing it, I believe in 2014 and I thought it was a relatively new blog. I learn so much from you and I love learning new things about Ireland. This brings up another issue as well. My wife and I own a home in Yahualica, Mexico where two other Americans live. This beautiful city is two hours from Guadalajara, in the state of Jalisco. I find Mexicans and the Irish are so much alike. Most Mexicans are Catholic and they like parties like us Irish. Like the Irish, they are hard working, family oriented and like wonderful Festivals and parties with friends. I as sure you probably know, as you know an infinite amount about Mother Ireland, that when the Irish came here to the states, they joined the military and the protestant officers would not permit the Irish to go to Mexican Catholic Churches. They had to go to protestant churches and they were ridiculed and tortured for the most mundane things. Finally, when America entered Mexico, many Irish felt they had more in common with the Mexicans and brought the American cannons, which the Irish were experts in having fought with the French, to Mexico. They formed the Saint Patrick’s Brigade. They fought all through Mexico and finally, when the Americans got into Mexico City, they hung many Irish and there is a place showing this near the National Palace in Mexico. My wife and I gave a class in Mexico to newly weds or people having problems, on how to have a happy marriage, in the church we were married in 15 years ago, Saint Michael the Archangel Church in Yahualica, Mexico, where we have our home. I also, just recently was talking to two very educated men, in Mexico, that talked history with me. I mentioned the Saint Patrick’s Brigade, which they were very well aware of, and we began to be good friends. They gave me a beautiful professional certificate saying that I was an “Honorary Mexican”. (I’m very proud of that certificate.) In our church in Mexico, there is a very big Celtic cross and in the grave yard, I also saw a Celtic Cross when almost all crosses in Spanish countries are Roman Catholic. I am hoping that some of the Irish who fought in the battle came to our city. Also, once I was in Mexico City, and they have a very big avenue called “Avenida O’ Sullivan. I wonder if this has to do with the Irish that fought in the Irish Brigade. If you have not read any books on this the following our great books: 1 “The Irish Soldiers of Mexico” by Michael Hogan. It is 15.96 on Amazon 2. “The Rogue’s March: John Riley and the St. Patrick’s Batallion 1846-48” by Peter F. Stevens. It is 9.30 in dollars on Amazon the last time I looked. Both are great books and they tell different things. After reading one, I had some questions still, but it was answered by the other book. Once again, thank you, Mairead, from the bottom of my heart on your great educational blog on Mother Ireland. Ray – Thanks for some more great book recommendations. A few years ago I watched the movie “One Man’s Hero” starring Tom Berenger, which tells the story of the San Patricios. I really enjoyed it, but I think it was a box office flop since some viewed it as anti-American. I’m happy to hear you feel so at home in Mexico. HI Ray, that always surprises and saddens me when such a huge and important part of history is lacking in the schools for children. In my experience here in America, history in general is mostly taught by dates and politics, which in my opinion goes right over the children’s’ heads. One cannot learn history by numbers; its too impersonal. Human experience is the only way to grasp history. I’m also reminded of the holocaust, which I am not by any means an expert on but covering up that atrocity and mass slaughter of innocent civilians would be just as appalling as covering up the Great Hunger in our schools. I applaud John Cassidy for bringing more attention to this awful time in Ireland and getting the media involved is fantastic. I hope the Irish schools are better at teaching history these days. It is not only bad what the Brits did during the Potato Famine, but now they want to make a comedy on the Famine. I first heard about this on Bridgid’s blog, but since then a professor of history has brought this up on her blog. This is basically what I wrote in response to the “British comedy”. It is disgusting that the Brits make any comedy about the Irish Famine. I did not hear about this until very recently. The Brits tried unsuccessfully to destroy our culture and now they want to make a comedy about the Irish Famine? It is totally sick unless they are psychotic or master masons like Ian Paisley and then I could see where the venom comes from. Actually, there was no famine; it’s pure propaganda. We had fishing, hunting and many food products that were sent to England. Ireland has always been a rich culture with many food products. The problem was that the Brits would not let have lands to develop other products, and all lands in Ireland belonged to them. They made laws against us for everything and would kill our people at the drop of a hat. I’m sure you heard the song, “Oh Paddy dear, and have you heard the news that’s going around? Their hanging men and women for the wearing of the green…” They made a law against Irish using standing bag pipes. The Irish got around this law by inventing sit down bag pipes. In the Pale they made a law against us having Irish names but we could have names of our trade or a color. That’s why you have Butlers, Carpenters, Browns, Whites , Blacks in Ireland. They wanted us to be like them, destroying our culture so we would not fight and we would be imitators of them . I cannot see any comedy in the tragedy that they caused. What next? A comedy on Bloody Sunday or Vinegar Hill, or Cromwell’s killing of 2,000 men, women and children at the Rock of Cashel in Tipperary when he burn’t down our church and horribly killed all our Irish brothers and sisters? This comedy is pathetic, but I should not be surprised that the Brits would make a mockery of their evil deeds. If you want to read a good book on the “famine” read “Paddy’s Lament” by Thomas Gallagher whose father immigrated from Ballaghaderreen, County Roscommon. It’s a great book. 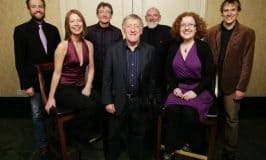 Normally, I try to have Irish humor when we are in the other Irish blogs but there is nothing humorous about this British “humor” so I am very indignant about their British fatuous humor. I was raised in an Irish Nationalist family and I am very proud of that! Hi Ray – I have read “Paddy’s Lament” and found it to be an invaluable source of information on the Irish Famine. What a wonderful book! I once again am getting ideas for blog posts from your comment. I might put together a list of my “Top Ten Books Relating to The Irish Famine”. My “to do” list just keeps growing and growing. I sense your outrage and frustration at these ill-informed British film makers who are planning to make a comedy about this tragic time. I tend to ignore such endeavors, because I truly believe these people are trying to stir up interest in their work, through the simple, age-old tactic of being controversial. As the old saying goes “bad press is better than no press”, so I am choosing the route of giving them no press right now. When a small group of people has an idiotic idea, they sometimes employ any means available to stir a little interest in their daft project. I truly believe the majority of English people would be outraged by this idea. And so, I will definitely ignore the antics of a misinformed minority for now. Not only the Quakers helped the Irish with food, but the Americans did too. By 1847 with world opinion against the Brits, 114 ships were sent to help the Irish including two American battleships with foods, the Jamestown and the Macedonia. Before this, the Brits said only other countries could send food by way of their ships to Ireland and then they had to pay to get the foods sent with the terrible famine. Despite their own great need and poverty, they gave so generously to the Irish. I have also heard that the Sultan of Turkey made a generous donation. Interesting that Ray should bring up the American contribution to aid for the Great Hunger. Now listen to this, evil and hardship do not go away; it actually extends across the Atlantic. And yes, I blame the Brits too! Thousands of people emigrated to American and some of the consequences were not pretty. This was the first big influx of Irish Catholics. There had been Protestants in American going back way before that. Lots of prejudice etc etc but more importantly disease. Contagious diseases. Read about Grose Isle in Quebec, Canada. The U.S closed their ports and many of those ships went into Canada. Now Ray, is giving me ideas for Celticthoughts.com too. Anyway thousands of Irish died of typhus, on the way over, while sitting in the harbor, and on shore. But not just the Irish. Many of Canadian doctors, nurses, and priests also died. There were so many people on the ships that they had to put up tiny shacks on shore to do triage. Most Canadians, terrified, stayed away but a few who were shamed by the church took in some of the orphans. Its a devastating story. So you see, that Famine affected parts of the whole world! People think it was simply an Irish problem. It was not. When we talk about the Potato Famine, there are so many aspects and levels that we can peel away. I was talking about only a small aspect of the problem and I emphasized Ireland only and how we had a holocaust of our own; however, Bridgid is absolutely correct about the wonderful Canadians and what happened to the Irish there. The two American battleships that I mentioned earlier brought almost twenty thousand tons of provisions to the Ireland for the Irish. That is not to say the Irish still did not suffer greatly wherever they went in the Diaspora to other countries. One might say, with all the obstacles put in front of the Irish in America and Canada, and the world, that they succeeded greatly but it took a long time. You might say the Irish “Went from the pot to the fire” even in America, especially when the Irish were tortured horribly here, before they went to fight with the Mexicans in the Saint Patrick’s Brigade. Those books I mentioned earlier will tell you how horribly the Irish were tortured before they fought on the side of Mexico. The movie, “One Man’s Hero”, was hygienically tame as not to offend the American audience, but the Irish fought with the Mexicans only after being tortured here, in America by protestant officers who hated us. My dad passed away when I was twenty-seven and he was sixty-seven, and he told me of stories about the prejudice that the Irish faced. I just retired in June 2014, and my dad was 18 years old when he was looking for a job during the Great Depression here. He told me that he went to many places to look for work and one was a gas station. The owner asked my dad, “Kid, how much college do you have?” My dad said he had none. The owner said he only hires college graduates because he could get them. My dad was turned away but not before he made an Irish comment that I cannot print here. In America, my dad said that he saw many signs saying, “No Irish Need Apply!” (My dad never even tried those places because he was very proud of being Irish.) So you see, the Irish even in my dad’s time, suffered prejudice. Later, my dad worked after the depression at Colgate Palmolive Company, and he became one of the highest paid workers there as he put the chemicals together to make soap and he became a journeyman soap maker. The great thing about the Irish was that even when they suffered, but when given a chance, like at Colgate’s, they excelled. God Bless the Irish! Thanks again, Ray for sharing more of your Irish American family stories, and for your insights into Irish history. Brighid – I agree with you about the multi-faceted affects of the Irish Famine and its global reach. Not only Ireland was affected, but England, Scotland, Wales, American, Canada, and Australia. I, like you, love to read history, and this period in Irish history fascinates me. I will write many more posts in the future to promote further discussion. Thanks Brian. 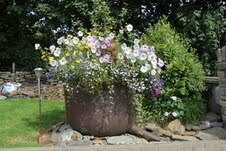 The famine pot filled with flowers is really eye catching. I hope Mattie and John have great success in locating more of these cultural treasures through this project. Thanks so much for all these wonderful pictures. I had heard of famine pots before but had no idea of what their actually size might have been and what they looked like. 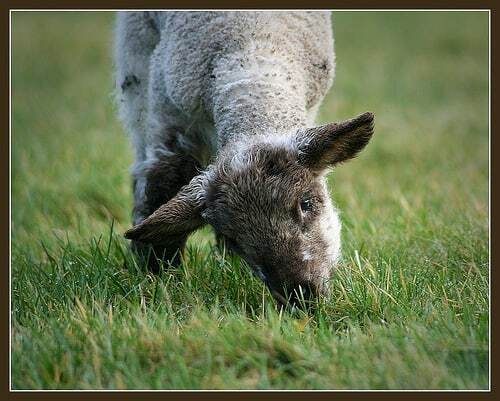 I really enjoy your informative posts, and thanks to Mattie Lennon for writing this informative piece. Hi Mags – I’m delighted this post by Mattie helped further your knowledge of famine pots. Thanks so much for checking out my ramblings. Two 2not-to-be-missed” books on the Irish Potato famine; A Suitable Channel, By Rob Goodbody and Charity and The Great Hunger by Professor Christine Kinealy. Hi Mairead, I agree with Mattie, I thought I knew a lot about the great famine, that was before I read ‘A suitable ChanneL’ and The Great Hunger, the kindness of strangers. They are a must read. Hi John – Thanks for these book recommendations. I hope to get around to reading them very soon. The story of Queen Victoria’s donation needing to be greater than the Sultan’s donation never ceases to amaze me. I recently learned how the Sultan sent ships of grain to Drogheda, and to this day the star and crescent of Turkey forms part of the town’s coat of arms. So many famine stories need to be shared, so thank you for adding to our knowledge of the Great Hunger. I am glad it is easy to comment on your new and beautiful post. I just read about Queen Victoria not wanting anything bigger than her donation. Although I never heard that one, it doesn’t surprise me about any queen of the English. Just go to Dublin Castle and the tour showed the queens royal huge chair, where they have to sit way up high, removed from the people, or beyond the people. On the far wall was a huge mirror and the docent stated that the royalty demanded the huge mirror so they could see themselves at all times as they sat in their royal chair. Now shifting to the present: I just read that Queen Elizabeth the Second , from the UFP News, it states that the queen owns 1/6 of the earth’s land surface more than any government in the world. The queen is head of the UK and 31 other States and Territories. She is the LEGAL OWNER of 6,600 million acres of land. The value of her lands alone are 17,600,000,000,000 pounds. (This was from the article of 11/14/2013.) Going to another article from the BBC online article, called “How Rich is the Queen”, by Alex Terrien, the queen got a 285 million profit in pounds last year. This BBC article was dated June 25, 2015. I guess, when one is English royalty, it is hard to think of the common man and woman, not mentioning the whole line, including Queen Victoria. After all, the Famine was not a famine at all but all the Irish products went to feed the English, and the Irish, well, unfortunately we Irish were an after thought. Hi Ray – There are many stories from the time of the Famine which need to be told. John Cassidy and Mattie Lennon are doing incredible work to preserve these old famine pots, and in the process they are discovering stories from the past. I look forward to learning more from them, and hope they will contribute some guest posts on the topic in the future. The DVD, ” IRISH FAMINE POT” is almost “ready to roll”, it’s in the final stages of editing. We’ll keep you posted. That’s great news, Mattie. Best of luck with the editing process. The response to our famine pot has been truly amazing, its getting a lot of coverage in the local media. Of the many emails and phone calls we have received I was quite taken back when I received a phone call from a Protestant Clergy man whose Church is on the Shankhill road in Belfast, inviting us to address a group of people from both sides of the ‘Peace Wall in that divided City. Its only recently that this Clergyman uncovered a graveyard off the Shankhill road that contains the remains of 1.000 victims ,both Catholic and Protestant . Most people who belonged to the Protestant faith thought the great famine only effected the people in the west of Ireland. Beautifully said, John. My sentiments also. I believe it’s important to tell our stories together. In Skibbereen where my family hails from, many died from all denominations. This is our past and by sharing the stories of our ancestors we can look to the future together. Wishing you every success on your trip. Mairead, when I was having the broken famine pot restored I decided to have a number of minature pots made as presents for relations in the U.S. They are made of stoneware clay in Skibbereen. The wooden base is a reminder of the many Irish people who died on the ‘Coffin Ships’ when fleeing the famine in Ireland. They are proving very popular not just in the U.S. but also in the UK. There is one of them on display in Stormont Buildings in Belfast. Hi John – I’m delighted to hear your DVD is nearing completion and that a path towards success is being laid out before you as you continue the work of promoting and marketing your project. Thanks so much for your generous gift. I’ll pop you an e-mail soon. Thanks for giving some coverage to this fascinating aspect of our history. Looking back I realise that there was a famine pot in the area I was raised but nobody cared or paid any attention to it. It is great to see that people from all backgrounds are paying showing an interest. ps that stuff above about Queen Elizabeth owning 1/6 of the land in the world is clearly nonsense. A moment’s rational thought (and an examination of the nonsensical article referenced) will show that. Thanks so much for checking out this post. It’s wonderful to see so many people getting involved to try to preserve these old pots – an important part of our heritage. Our site is being updated at the moment it will have further information on the workhouses and the Coffin ships. In 1847 Landlord Walter Chorley purchased Aranmore Island, a Island of the coast of Donegal, for 200 pounds. He wanted to reduce the number of poor people living there he promised them free passage to North America. Unable to gain admittance to Glenties Workhouse, they spent night in a nearby field. They eventually arrived in Dongal Town but there was no ship awaiting them. Newspaper reopots from the time claimed ;were it not for the kindness of the people of Donegal Town the Islanders would have died of hunger or disease. The Islanders sailed from Donegal on March 8th 1848, on board a ship called the Countess of Aran arriving in Canada 6 weeks later. Many of them made their way in to the USA . Quite a number of them settled on Beaver Island. The Beaver Island website recalls their journey from their Island home in the famine years of 1847.
with a bit of luck the Irish American Mum could be in Donegal around that time and may join us for part of the walk. Hi John – Thanks so much for providing the link to the Irish Workhouse Centre in Portumna. What an important project! I will have to write a blog post about the workhouse soon and include links to this site. It’s on my to do list. Thanks also for sharing the story of the Aranmore islanders and their long walk to Donegal town, their trials and disappointments and their eventual arrival in Canada. 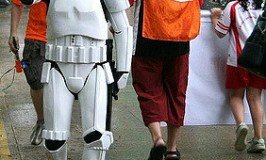 Commemorating their walk next year is a wonderful idea. If I’m in Ireland I’d love to join you. Do keep me posted on the Donegal Association’s plans and I’ll see if I can make it. 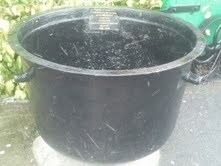 I have 1 large skillet cast iron pot with the shamrock embedded onto it . As I am Irish I know the history attached to these items. I also have a smaller 1 but alas it is slightly damaged. It was my intention to upload photos of same for some reason unknown to me my scanner will not allow me to do so. I am happy to send photographs of them by mail should you wish to contact me by email with address of where to send them by express mail. I am down sizing my home now as I live alone now and it will be with a heavy heart I will be selling them as I will have no where in my new home to store them . Wonderful work you are doing . Well Done. 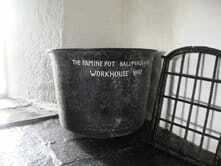 You can post the pics to; Irish Famine Pots, 4 Ardmore avenue, Dublin 7.